The PRIMA CS is a versatile solution for surgical and diagnostic work in gynecology. A meticulously designed optical system and built-in high power LED illumination module come together to provide a more streamlined microscope. 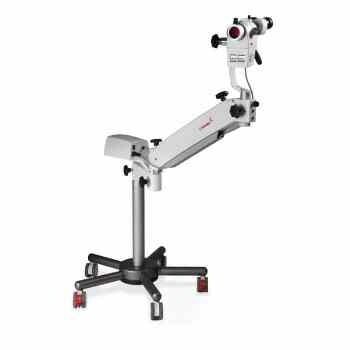 A suspension and swivel arm mounted on a stable base brings greater flexibility to both clinical and surgical environments. A single 27-watt LED intelligently drives the illumination system to deliver over 75,000 lux at a carefully selected color temperature of 3700 K, making Prima CS’s eye-pleasing illumination the brightest in its class. Built into the magnichanger, the LED design makes the system more compact and runs cool for over 50,000 hours. An Apochromatic 5-step Galilean optical system produces aberration-free images corrected for all primary wavelengths. Proprietary MaxLite™ coatings promise the highest degree of anti-reflective and scratch resistant properties, illuminating images evenly and without artifacts. Fine focusing control is provided through a range of long working distance CMOs. To address digital documentation needs, a host of digital SLR, video camera, and CCD adapters are available with the ProLine™ in addition to our proprietary iVu S5 in-line solution.